For my first contribution here on the site, I'm resisting the urge to break the ice with some kind of soft topic like new tech, gear reviews, or uplifting thoughts on fatherhood (all thing's I'd rather be writing, if I'm completely honest). Instead, I'm going to dive in with a short story about getting lost in career transitions and finding myself on the other side, all with the help of parenthood. Both of my parents jumped into career paths in the same way that lots of baby boomers did. They started something young and more-or-less stuck with it to this day. In contrast to this marathon model of career, my work life has been a series of shorter sprints and non-linear wanders. I have a bachelor's and master's degree in studio art; I've worked in commercial printing, higher education, retail, and public safety all before reaching where I am now as a part time stay-at-home dad and professional photographer. As a male growing up in a working-class Midwest family, my identity is very much tied to work. I've been working since my early teens, hustling around the neighborhood and cutting grass until I was old enough to drive and get a job. In the decades since then (holy crap, there have been decades since then!? ), I've continued to pour myself into whatever work that I am doing. In May of 2010, I had just completed 7 years in college and graduated with a Master of Fine Art degree in Studio Art. I was all-in with this path, but I had zero aspiration of being an "artist." Why would I? That's ridiculous and impractical. I had gotten this far with the hopes of teaching art at a college level. I'd been teaching throughout grad school and really loved it. The part that I didn't like, however, was pretending to want to be an artist to get that far. It was tiring. For those that have blocked out their memories from that time in history, the economy in the US in 2008-9 was garbage and people were a bit skittish. In the years following, universities were cutting costs wherever they could. My own alma mater had just closed their Theatre department. Seriously, what college or university doesn't have a Theatre department? We all use Google to look things up. Well, that's what I did one day when trying to figure out if "Dad" and "Father" meant the same thing. Go ahead, try it yourself right now. "Okay, Google. What's the definition of dad?" 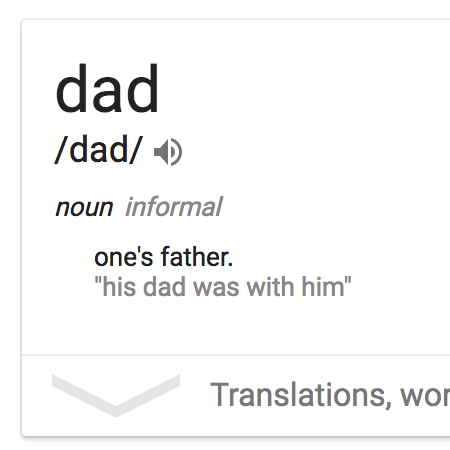 Google says dad and father are the same thing, but I respectfully disagree. Here's what I think the real definition of "dad" is and why I think it's time for Google to make a distinction between a "father" and a "dad". Read my definition and let me know what you think! Unsurprisingly, my dozens and dozens of applications to teach at various universities and colleges resulted in zero jobs. I had one interview, but it was for a gig teaching graphic design (that I have no formal education in) at a community college, 2 hours away, in a state prison--and I didn't get that job either. Academic hiring is very seasonal and it was clear that I was not going to be teaching anywhere the following year. I was unemployed for the first time in my life. I was unemployed for the first time in my life. I built the cherry book case and changing station behind me. I'd spent my life identifying myself with whatever work I was doing--and suddenly I didn't have that. What I did have was student loans to pay, and a patient and supportive wife who was in the middle of graduate school at the same university. We were going to be in the same college town for a few more years, so I did the responsible thing and set out to get a "job". The process is very different and much less daunting when looking for a job versus looking for a career. It is a matter of, "What can I tolerate to do for money?" instead of "What do I want to do with my life?" In my case, I did a short stint in a factory before taking a job that I felt completely unqualified for and wasn't sure that I wanted to do. I became a 911 dispatcher. The job was stressful, the hours were weird, and it couldn't have been a more different experience from teaching drawing and printmaking to a bunch of college kids. I was way outside of my comfort zone, but eventually I became comfortable. I was doing something good. The stress of the job somehow put the pressures of daily life in perspective. I started making stuff again, converting our garage into a woodshop. My wife and I got a dog, fast forward a few years, we also had our first child. I was way outside of my comfort zone, but eventually I became comfortable. At the end of my wife's graduate program, we decided to move back to our home state of Iowa. She was able to get an internship and later a job where she still works today. After weighing my options for jobs and thinking hard about our daughter, we decided that I'd be a full time stay-at-home dad and try to be a photographer when possible. As we prepared to move cross country with our then 7 month old daughter, I was also hustling to build the illusion of a business out of photography work that I'd been doing on the side. We made the move and I worked slowly to build the business into something sustainable. The funny thing is, though, that I don't remember much of the business stuff from the past two and a half years. I know that there was lots of lost sleep and late nights learning and working. What I do remember is watching my little girl grow up, helping her through some rough toddler stuff on a daily basis, potty training, outdoor adventures, and having an amazing sidekick all the while. Somewhere in this time, my identity shifted. Yes, I'm still a photographer and occupationally that is a big part of how I view myself--but the stay-at-home-dad role has became an integral and balancing part of who I am. Hello, my name is Ben and I’m a photographer, amateur woodworker, artist, road-trip enthusiast, trophy husband, and dad to a fiery ginger daughter (with a second on the way). I live in Ames, IA with my amazing wife Nichole, daughter Nora, and dog Layla.